HTMLTable contains the common table algorithms for Grid and FlexTable. This class contains methods used to format a table's cells. This class contains methods used to format a table's columns. This class contains methods used to format a table's rows. Create a new empty HTML Table. Bounds checks that the cell exists at the specified location. Checks that the row is within the correct bounds. Removes all widgets from this table, but does not remove other HTML or text contents of cells. Removes all widgets from this table, optionally clearing the inner HTML of each cell. Clears the cell at the given row and column. Gets the table's TBODY element. Gets the number of cells in a given row. Given a click event, return the Cell that was clicked, or null if the event did not hit this table. 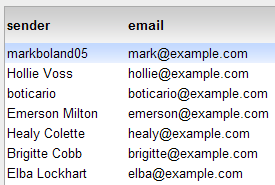 Gets the HTMLTable.CellFormatter associated with this table. Gets the amount of padding that is added around all cells. Gets the amount of spacing that is added around all cells. Directly ask the underlying DOM what the cell count on the given row is. Call and override getDOMCellCount(Element, int) instead. Directly ask the underlying DOM what the row count is. Call and override getDOMRowCount(Element) instead. Determines the TD associated with the specified event. Gets the HTML contents of the specified cell. Gets the number of rows present in this table. Gets the RowFormatter associated with this table. Gets the text within the specified cell. Gets the widget in the specified cell. Inserts a new cell into the specified row. Inserts a number of cells before the specified cell. Does actual clearing, used by clearCell and cleanCell. Call and override internalClearCell(Element, boolean) instead. Determines whether the specified cell exists. Returns an iterator containing all the widgets in this table. Affected Elements: -(row)#-(cell)# = the cell at the given row and cell index. Subclasses can implement this method. Remove the specified widget from the table. Sets the width of the table's border. Sets the amount of padding to be added around all cells. Sets the amount of spacing to be added around all cells. Sets the HTML contents of the specified cell. Sets the text within the specified cell. Sets the widget within the specified cell. Adds a listener to the current table. Removes all widgets from this table, optionally clearing the inner HTML of each cell. Note that this method does not remove any cells or rows. clearInnerHTML - should the cell's inner html be cleared? Clears the cell at the given row and column. If it contains a Widget, it will be removed from the table. If not, its contents will simply be cleared. Given a click event, return the Cell that was clicked, or null if the event did not hit this table. The cell can also be null if the click event does not occur on a specific cell. was the widget removed from the table. Removes the specified table listener. Sets the width of the table's border. This border is displayed around all cells in the table. Inherited implementations may either throw IndexOutOfBounds exception if the cell does not exist, or allocate a new cell to store the content. FlexTable will automatically allocate the cell at the correct location and then set the widget. Grid will set the widget if and only if the cell is within the Grid's bounding box. Creates a new cell. Override this method if the cell should have initial contents. Deprecated. Call and override getDOMCellCount(Element, int) instead. Deprecated. Call and override getDOMRowCount(Element) instead. the TD associated with the event, or null if none is found. Does actual clearing, used by clearCell and cleanCell. All HTMLTable methods should use internalClearCell rather than clearCell, as clearCell may be overridden in subclasses to format an empty cell. Deprecated. Call and override internalClearCell(Element, boolean) instead. -(row)#-(cell)# = the cell at the given row and cell index. Subclasses must implement this method. It allows them to decide what to do just before a cell is accessed. If the cell already exists, this method must do nothing. Otherwise, a subclass must either ensure that the cell exists or throw an IndexOutOfBoundsException. Subclasses can implement this method. It allows them to decide what to do just before a column is accessed. For classes, such as FlexTable, that do not have a concept of a global column length can ignore this method. Subclasses must implement this method. If the row already exists, this method must do nothing. Otherwise, a subclass must either ensure that the row exists or throw an IndexOutOfBoundsException.